As standards of conduct continue to erode in our shock-proof world, we must fight the soul pollution threatening our health, our faith, and our witness to others. Without even knowing it, people willingly inhale second-hand toxins poisoning their relationship with God and stunting their spiritual growth. Soul Detox examines the toxins that assault us daily including: toxic influences, toxic emotions, and toxic behaviors. 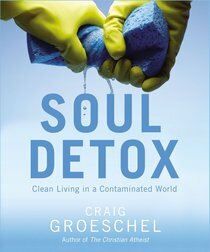 By examining the toxins that assault us daily, this book offers the ultimate spiritual intervention with ways to remain clean, pure, and focused on the standard of God's holiness. Craig Groeschel is the founding and senior pastor of LifeChurch.tv, one of the country's first multicampus churches, with thirty-one weekly worship experiences at seven locations. Craig, his wife, Amy, and their six children live in the Edmond, Oklahoma, area, where LifeChurch.tv began in 1996. Craig and Amy's passion, to lead people to become fully devoted followers of Christ, is the driving force behind his down-to-earth teaching that touches thousands of people weekly. Craig earned his BA in marketing from Oklahoma City University and his MDiv from Phillips Theological Seminary.